Federal regulators looking into the safety of this baby bedding item. Bumper pads around the inside of a crib make the baby bed look cozy and safe, but health and consumer experts say they're dangerous, the Chicago Tribune reports. For years now, federal regulators have known that bumper pads could pose a suffocation hazard in babies but have failed to warn parents. 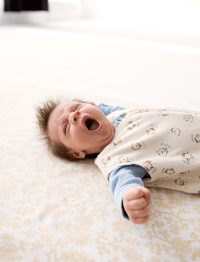 Earlier this month, in the wake of growing concerns from parents and consumers, the U.S. Consumer Product Safety Commission said it will re-examine the safety of crib bumpers. Its investigation will include "reopening files on babies' deaths, evaluating the safety of bumper pads on store shelves and rethinking how investigators examine deaths where bumper pads are present," according to the Tribune article. Experts say the death toll linked to bumper pads is not accurate because those cases can be wrongly labeled as sudden infant death syndrome (SIDS). Fit Pregnancy experts say there should be nothing else in the crib with your baby while he or she sleeps. (Another option would be to practice family bed, which presents another set of precautions.) In the crib, there should just be a flat fitted sheet on the mattress, nothing cushy and nothing heavy; no blankets and no toys. If you do want to use a crib bumper, choose a breathable option. Catching some z's is easier said than done for parents of a new baby, but both will sleep safely (and soundly, we hope) if you follow this rule: When using a crib, place a baby alone on his or her back. What you need to protect your baby changes with his or her development, so here's a timeline to help you prepare.